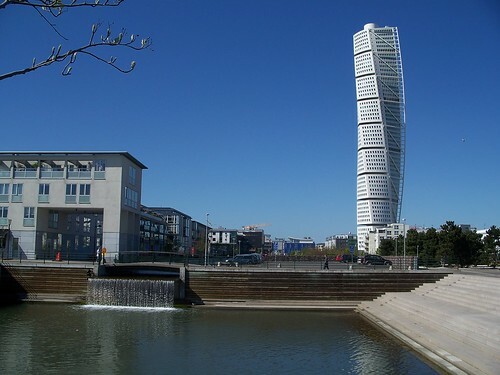 Presiding the skyline of Malmö, we can find the Turning Torso, which with its 190.4 meters high is the tallest skyscraper in Sweden and the main symbol of the internationalised Malmö of the 21 Century. Type: Residencial and office building. The Turning Torso was designed by Santiago Calatrava, an Spanish architect famous for jobs like Ciutat de les Arts i les Ciències (Valencia, Spain), Milwaukee Art Museum (Milwaukee, Wisconsin, USA) or Gare do Oriente (Lisbon, Portugal). Some of his currently ongoing jobs comprehend the World Trade Center Transportation Hub (New York City, USA) and the Chicago Spire (Chicago, Illinois, USA). 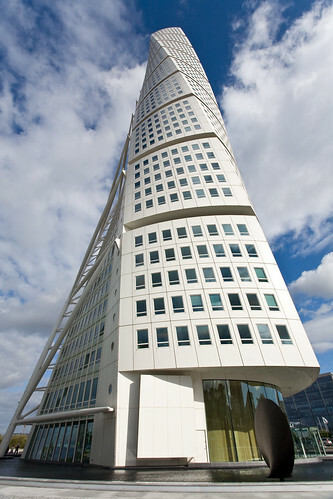 The main attractive of this skyscraper is its twisting shape, for the top of the building is twisted ninety degrees clockwise with respect to the ground floor. 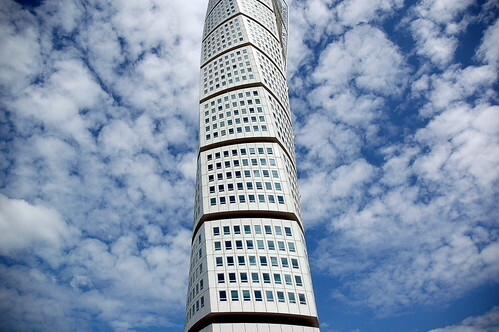 This spectacularity and complexity achieved that the Turning Torso replaced the Öresund Bridge as the top engineering construction of Malmö. The construction of the building started in the summer of 2001 and finished on August 2005, and in its 190 meters we can find 9 cubes hosting 54 stories. While the 2 bottom cubes hold offices, the rest is destined to luxury apartments. So this is really a must see, not only in Malmö, but in the whole Nordic region. Unfortunately when I visited the city there was a quite bad weather with a lot of fog, so from the ground you couldn’t be able to see the top of the building. I hope to be able to go back when there’s good weather, so I can completely enjoy the view of this fantastic building. As I previously said, when I was in Malmö there were a lot of fog, so I couldn’t take any decent picture of the building. The pictures you can see in this post are Creative Commons pictures found on Flickr, and each one has a link to its original site. Yeah, it’s really a very impressive building!